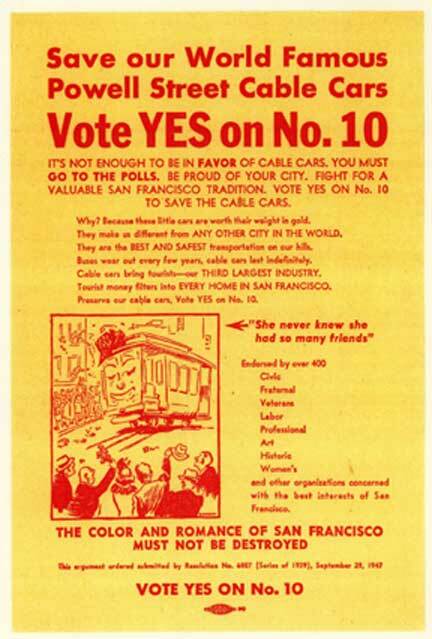 This November 4, 2007, all San Franciscans should pause a moment to reflect on a ballot measure, #10, which appeared on the election slate in 1947 and proposed a charter amendment to preserve and protect two of the City’s remaining cable car lines in perpetuity. If not for this measure, San Francisco could well have lost part of its unique charm and individuality, and become just another municipality with cars, buses, and parking lots to express its heartbeat. The Powell-Mason and Washington-Jackson lines had been taken over by the Municipal Railway only three years earlier, in 1944, when the Market Street Railway ceased operations. Mayor Roger Lapham, a shipping tycoon elected as mayor on a progressive ticket, wanted to scrap the remnants of the old Ferries & Cliff House line, which had begun cable operations in 1887. The war was over and the automobile was the way of the future, according to city planners. Shiny new diesel buses would replace the Victorian era cable cars as well as many streetcar lines in the modern city. In the rush to “modernize”, Lapham and his pro-bus allies overlooked the fact that San Francisco cherished its past, to a degree that other cities often found incredible. The City has had a brief history, compared to other places, but it has been a wild, lusty, and often raucous past that was the stuff of dreams and romance for generations of citizens and visitors alike. Diesel buses did not prompt romance in the minds of riders, and there were no thrills to be found in chugging over a hill, belching exhaust fumes as it went. A small group of people in the San Francisco Federation of Arts held a meeting in response to the rumors of the cable cars’ impending demise. They quickly formed an organization named the “Citizens Committee to Save the Cable Cars” and went to work. They circulated letters and petitions throughout the City urging its citizens to join in the fight. They deluged politicians with letters of protest, but the City fathers ignored them, dismissing them as mere sentimental dreamers. The leader of this stalwart band of “dreamers” was a lady named Friedel Klussmann. She may have been sentimental about cable cars, but she was no pushover. She once said that she had been told that nothing terrified politicians more than “a delegation of women marching up the steps of City Hall.” She did just that. She and her committee members pushed the issue before Mayor Lapham and members of the Board of Supervisors. Yet, while the politicians tried to dismiss her, Klussmann and her committee proposed a ballot initiative to amend the City Charter so that cable cars could never be eliminated again. Although the pro-bus politicians and the Public Utilities Commission tried to silence the protest, the City Attorney ruled that they had every right to put this measure on the ballot. And so it was placed before the voters to decide on the cable cars’ fate in November. Meanwhile, the battle heated up. The mayor’s committees released public statements on the dangers of the system, and the costs of damages and operation. Klussmann countered with reports that put the lie to the “official” estimates. Transit authorities supported the Committee by endorsing the safety of cable systems for mass transportation over hills. Klussmann criticized the government reports, which favored the gasoline and rubber manufacturers. Then, the battle was enjoined across the country and around the world. Media like Life, Time, and The Saturday Evening Post all ran features on the cable car “wars”. Papers in the City and around the country ran editorials on the imminent threat to the cable cars in their natal city. Letters poured in to the dailies and the Citizen’s Committee in support of the cars, from people who had visited the City over the years and could not imagine it without its cable system. Celebrities like Irene Dunne, Billie Burke, Laurence Tibbet and Katherine Cornell, who said she would never return to San Francisco if the cars were scrapped, all weighed in support of the cable cars. 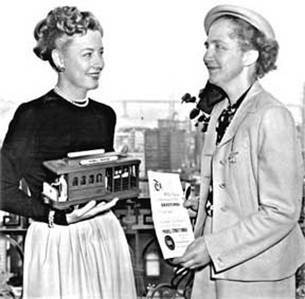 The Emporium designed cable car dresses, Glen Hurlbut composed a Cable Car Concerto, and Eleanor Roosevelt defended the cars in her daily column “My Day”. Perhaps the most vehement responses came in reaction to an ad placed in Time magazine by Richard Gump, head of Gump’s, a San Francisco store and institution as well, dating back to the Gold Rush. Mr. Gump asked for outsider’s opinions on the question: Should the City abandon the cable car lines or not? The response was titanic. Letters poured in by the sackfull, all advocating that the City retain its cable cars and with them its charm. Out of all the letters Gump received, there was only one against the proposal to save the cable cars. The world had spoken. 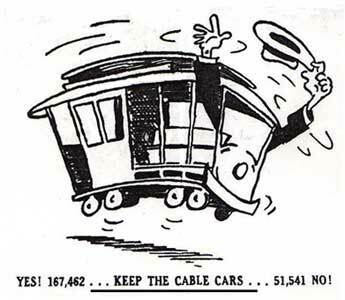 Elmer Robinson, who was running for mayor in the 1947 election, took advantage of the uproar to declare his support for the cable cars. He spent the campaign riding cars and ringing their bells, making the issue synonymous with his bid for mayor. The election became a referendum of sorts on Lapham, his allies on the Board, and “progressive, businesslike government” in general. Local newspapers and citizens alike might have been torn on various issues and candidates in this election, but not on Measure 10. All dailies supported it and in the end it won a resounding victory of 170,000 for and only 50,000 opposed to it. The cable cars had won. The Examiner proclaimed “San Francisco’s cable cars clanged a clarion chorus of victory last night, as returns gave an overwhelming vote favoring continued operation of the ancient hill-climbers.” The battle had been won, but it turned out to be only the opening salvo in a war that would last another seven years, and eventually see San Francisco lose half of its cable car lines. Still it was an important victory, and assuredly without Mrs. Klussmann and the Committee to Save the Cable Cars, the City would have lost all its lines, and with that part of its magic and allure. As we look at the system today, universally beloved, protected, and recently restored, it is hard to imagine anyone advocating its destruction. Sixty years later, we do well to remember the efforts of San Franciscans and others to fight for the cable cars, and the priceless legacy they gave us.